The Valley House is composed of 2 double bedrooms, one single bedroom, large bathroom, living room and kitchen, outdoor living room with expansive views of the wonderful pure nature landscape, in front of this room has a balcony about 12 meters, barbecue, and a beautiful terrace to the upper level rooms. Peace and tranquility are the Kings, this wonderful landscape, Goshawk saw. My fiancé and I enjoyed a lovely stay for 4 nights. 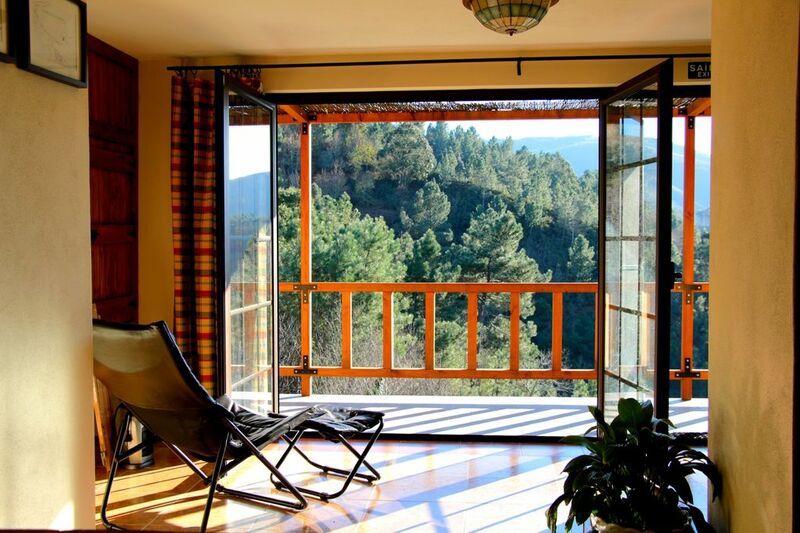 The apartment is absolutely lovely with fantastic views of the valley and surrounding mountains. The orange tree just outside was also great to make some fresh orange juice. The hosts were very nice and accommodating. Plenty of space including a large bathroom/shower. Will definitely be back. Olá Jay e Samantha, agradecemos o vosso comentário, esperamos recebe-los de novo. The house has everything you need.Beautiful view of the valley.Quiet. Hospitable hosts, left us wine and some products, it was nice. The only one thing we had no luck with the weather, it was very hot and the air conditioning worked not enough.And there was no mosquito nets on the bedroom door and we were biteen by mosquitoes. But in general the house is very good and I recommend it to everyone. Theresa and Natalino are the perfect hosts, so welcoming and generous, we felt at home immediately. The house is excellent, clean and well equipped and we much appreciated the food and wine left for our arrival. The surrounding area is beautiful with lots of interesting villages to visit.We thoroughly enjoyed our stay at Casa Do Vale. Hello friends, thank you for your comment, you are very warm people, and nice, we hope to return. We had a very enjoyable holiday the property and everything provided was of an exceptionally high standard. Our hosts were an absolute delight to meet they were very kind and friendly. We would highly recommend this holiday venue. Alan and Jane, are an exceptional couple, communicative and very friendly, we really enjoyed receiving them. Not forgetting your friends, who are also a friend. See you soon, and thanks for your stay. Afgelegen en in gebied waar bosbrand is geweest. Ik wil waarschuwen voor de omgeving van deze locatie. Er zijn nog veel verbrande bomen op de (lange) weg naar de woning. Ook is het laatste stuk van deze weg heel smal en niet geschikt voor brede auto's. Locatie is erg afgelegen en er is daar verder niets. Como indicado na publicação no site, a casa é situada, no meio de uma pequena aldeia (Bocado), na encosta da serra. O descanso, e a localização, são parte dos pontos fortes da casa, além das condições excelentes da própria casa. Primamos pela educação, e forma de receber os nossos hóspedes. Estes hóspedes, não chegaram a ver a casa, mas não houve cancelamento. L'endroit est magnifique dans les montagnes. Les hôtes sont très accueillants et aidants. La maison est belle et très propre.